It’s about time that we update the Mauritius cost of living thread to reflect 2012 prices, as we head into the 2011 and 2012 season! The original cost of living post can be found here, and below is an attempt at gathering the cost of living in Mauritius 2012. This time we went out with a shopping list filled with random common supermarket items, and we did the shopping in one of the branches of the popular Winner’s supermarket chain. Winner’s supermarket stores are typically found on the outskirts of major towns and cities. 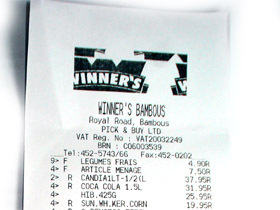 We happened to be in the north of Black River, so for this particular shopping spree, we went to Winner’s Bambous (which is located in central Bambous). For a larger selection of European and American brand produce, the popular London Way supermarket in La Preneuse stocks most European brand name items at mid range prices. For a near French E.Leclerc or Carrefour, or a British Tesco experience, the Super U Hypermarket in Grand Baie is where to head. This hypermarket stocks pretty much anything you can think of, but naturally at a cost. Depending on the product, prices here tend to be around 10-30% higher than Winner’s and other budget supermarket chains, although Super U frequently has attractive pricing on alcoholic beverages. As one can see, prices have gone up a bit compared to a couple of years ago, which is of course natural. The good thing is that a euro will still buy you a good 40 something Mauritian rupees. This means that a litre of petrol is still around the euro or pound mark, and you can still eat a three course dinner in an average restaurant for less than €20 or £17. For a fresh Winner’s receipt and a document of proof of our efforts, please click the image to enlarge. For the record, we’re not sponsored by Winner’s (or any other supermarket chain for that matter), we simply went for one of the cheaper supermarket chains that sell a good mix of local and international produce. We hope that you find this post useful. If you do (or if you don’t), feel free to post your comment below, and any suggestions to make it better are of course also welcome! Thanks for the post guys, I am going to Mauritius next week and everything is settled for the trip. I understand we cant have a comprehensive list, but just for food local/homemade including 3×20 pack cigarettes/week can a single person survive with 4000MUR for a month 4-5 weeks? I have accommodation(non-food)/travel booked separately with a separate budget for drinks. Would be great if you could answer sooner. 3×20 packs of cigarettes (100/pack) a week would leave you with 2800 for 4-5 weeks food, or 75-90 rupees a day. Unless you’re a vegetarian and cook everything yourself, you will struggle to get by on this budget. Still, it would not be impossible, if you just stick to local produce. You will also find that local street food is very cheap (if outside touristy areas), and roti, dhol puri, samosas and other local fast food will fill you up for less than 20 rupees. Add another 10 rupees and you have a full chicken noodle meal. Unless you plan on drinking tap water, you should also budget with an extra 1000 or so for bottled water. Pls, I am interested to further my education in mauritius (Middlesex university Vacoas campus). can somebody tell me how the living cost is vacoas-phoenix area. like how much will a student can spend per month excluding accommodation? Best friend (he’s from there) we are staying with his parents and most of the food will be covered , now I’m bringing 1500$ Canadian and I looked it up and it said that I would have about 45,893 rupees … Would that be enough to go to Mauritius for the month ? Hi Ka. If 45,000 is enough really depends on what you’re planning on doing while you’re in Mauritius. An example: If you start your day with a luxury hotel breakfast, continue with a Big Game Fishing trip followed by some Port Louis Caudan lunch and shopping, and then round off with dinner in an upmarket restaurant, 45,000 will not get you that far in one day! On the other hand, the vast majority of Mauritian working citizens in full time employment take home less than 25,000 a month – so in that light, you are a very wealthy visitor with your 45,000 spending budget. From a Canadian perspective, Mauritius can be very cheap – if you just carefully choose what you spend your money on. I am coming to Mauritius late September for studies at Middlesex University. Vacoas-Phoenix is generally somewhat cheaper than the coastal areas, but the major supermarket chains typically have nationwide prices. As for budget, this is a very individual question and a normal student life for some, is something completely different for others. We’d suggest that you get in touch with the university staff and their student forums. They should be able to guide you in the right direction. I am coming to Mauritius in December2012 for 1 week. I am interested in knowing the basic cost of meal in an average restaurant in Indian rupees or MUR. Will 1000 USD would be enough for the 1 week tour? Excluding hotel charges. Restaurants in the larger cities away from the coast are generally cheaper. Basic “street” food, such as roti with vegetarian filling is typically Rs 10-20 and vegetarian samosas typically come in “3 for 10” (3 samosas, 10 rupees) offers (MUR). hi I am currently live in Mumbai and planning to relocate to Mauritius. would live to know the standard of living ,and the rates for domestic help and a driver.What language is used in local market??? We are looking to relocate to maurituis. My wife has a oppertunity to get a job with a salary of 90 000 rupees. we have two boys 15 yrs and 13 yrs. Will we be able to survive with this. Christo, it all depends on what standard of living you expect, but yes, at that salary you will be able to live very comfortably, and still have some savings left at the end of the month. Apart from rent, your big budget busters will be on education for your children (if private) and transport (if car rental). Electricity is also something to keep in mind, as it gets more expensive the more you consume. It’s not difficult to spend 10,000 rupees a month on electricity alone if you need a fully air conditioned home for a family of four. You should also check out if your wife’s employer offer a medical insurance for your family. Mee, I’m afraid we have little knowledge on the standard of living from an Indian perspective. I’d suggest you get in touch with forums for Indians in Mauritius. A large population of Mauritius comes from India, so you would have no problem finding like minded people from your country and culture. Hi i have been offered a job in Mauritius and will be earring R25000.00 i wanted to know will that be enough to manage to adults living there as my husband will not be employed when we first move? Taryn, unless you already have a Mauritian citizenship, a salary of 25,000 would not qualify you for an occupation permit. Employers recruiting abroad need to offer you a minimum salary of 30,000 a month. I’m not sure what you mean with 25,000×3 but if your monthly salary is Rs 75,000 you will no doubt live a very comfortable life. Akki, get in touch with your fellow students and the school where you will be studying. They should be able to guide you in the right direction. Food costs depend largely on if you are a vegetarian or not. There is a vast number of vegetarians in Mauritius, and consequently, vegetarian food (locally produced) is cheap. Meat is mostly imported from India, East Africa, Europe, SA and Australia, so expect to pay more if you eat meat. I am from South Africa and will be holidaying in Mauritus for 7 days over the easter break. Could I have an update on the Cost of living in Mauritius 2012. Hi Sharlene. There is little change in nominal pricing from a year ago. On the contrary, prices seem to have come down a bit with the advent of several new major supermarkets across the island, which has increased the competition. The biggest difference for South Africans will be in currency fluctuations. A couple of years ago you would get 4,50 Mauritian rupees for every rand, which is now down to around 3,50 rupees, so in that sense, South Africans might experience that Mauritius have become slightly more expensive. Hi! I will have an interview with a company from Rose Hill in Mauritius and if I’m lucky I might go there for 6 moths. They say the salary is US $570. From most of the websites I see this should be enough to cover the living expenses but I see different opinions on different forums. I know it’s hard to tell because each individual spends differently but I’m interested to know if this covers the rent for a room (shared apt), meals, maybe a drink and eating out and some miscellaneous. Thanks! If you’re lucky, you won’t get the job! Employers recruiting abroad need to offer you a minimum salary of 30,000 a month (by law). An employer offering you less than the legal minimum for Occupation Permit qualification is to be regarded with caution, to say the least. If you accept and sign a contract, chances are that you will end up working uninsured and with no official work permit. In other words, you will become an illegal immigrant with no medical insurance, facing imprisonment if discovered. Not recommended under any circumstances. I have recently been offered a job in Mauritius which pays 45000 MUR , accommodation, food and transportation are taken care of.. is this an ok pay to live there and probably save up some money..
Hi Simone. Considering that your accommodation, food and transport is paid for, you could translate that salary to perhaps 75,000 a month or more if you would pay your own bills (depending on the standard of your accommodation). A very small percentage of the population have a salary exceeding 75,000 a month, so in that sense, you will be a high earner, and consequently you should be able to live very comfortably and still have quite a bit of savings at the end of every month. 1.cost of living in mur. 2.good 1 bed room or studio apt. 4.i will be getting a stipened of 10000 mur then how much extra do i need as i am a vegetarian. Hi Kushagra. Try getting in touch with the student union at your school or university. They will have a good idea of the cost of living in the Rose Belle area and can probably give you guidance on both accommodation and transport around Rose Belle. sir this is kushagra again i want to know in general the cost of living and the cost of rent in and around rose belle area.as well as if some estate agents can contact me then it will be great. Hello sir.i am from India i am planning to go to mauritius on study visa. cudu plz tell me that how much i can earn per month on internship. and how much are the living expenses. can i geta job easily in hotel or retaurants over there. and how much will be the average salary package. Harjinder singh, sanjay and others. Numbers on cost of living are always individual, as they depend on what level of comfort you want. For some, Rs 20,000 a month is a very good salary, and for others, Rs 50,000 is not enough to live comfortably. If you are planning on studying in Mauritius, simply get in touch with the school or university where you plan on studying. They have lots of information and guidance to offer, and student forums where you can get in touch with other students that can give you advice. Pintu, at USD 6,000 or close to Rs 190,000 a month you would be amongst a few privileged people. Relative to the population, very few Mauritians make that money. In fact, this is more money per month than what most people make in a year. In case you have a comparable salary in India, you can probably afford a trip to Mauritius before deciding. Our advice would therefore be to pay a visit to the island and see for yourself. In the private sector you will find state of the art healthcare, such as the Apollo Bramwell hospital for example. As for housing, the rent will depend on your expected level of comfort, location etc, but at Rs 190,000 a month, money will probably be your smallest problem. thanks for sharing your views. my salary is same but in INR so effectively both are comparable if i consider the cost of living. ( i was told that the cost of living compared to india is 1:2). Apollo is actually an Indian specialty hospital so i can understand the quality. How about education. I have two children both studying in the best of the Indian Pvt school. is the education comparable. will they feel left behind when they come back. ( the contract is for 3 years). can you give me indication of how much will a 3 bedroom fully furnished apartment will cost. what is the expenditure on food , electricity and education ( the better ones). I expect to save some money by shifting to this country. will i be able to save? Hello again Pintu, your questions are difficult to answer, as every person has their own preferred level of comfort, standard etc. A beach front villa with pool, gardener and maid is not comparable to an inland apartment in a housing block and so forth. You can find three bedroom apartments from less than Rs 10,000, but you can also find one that cost Rs 25,000 or even Rs 50,000. It all depends on the location and your requirements. Keep in mind that the absolute majority of the Mauritian population earn less than Rs 20,000 a month. With your salary at over 2 million a year, you really don’t need to worry about cost of electricity etc, as it is such a small part of your monthly expenses. Private education fees vary depending on the schools. Our advice would be to get in touch with fellow indian people in Mauritius, as they will be able to see everything from your perspective. Can you update the price list as of Jan. 2015. Hi, I got an offer to work in Mauritius with INR 30000 per month. Accommodation is free with telephone and internet charges except food. Can I make some savings from this earning. How much come for transport and food per month…? I don’t know whether to accept this offer or reject it. Please guide me…. i have offer 55000MRS with accommodation with basic fitting with 5 % deduction form salary. its is enough for 2 person to live good life. Hello I want to come and live in Mauritius for atleast 3months, but I choose a low cost budget for accomodation. I want a good one room accomodation. Do you have any suggestions for me? ?